What better activity for Hobart Show Day than a bushwalk somewhere quite a long way from Elwick! The weather forecast was good, and with a dusting of snow on many peaks during the week, Hartz looked like a good idea for a half-day trip. When I started from the car park just before 8am, the sun was out in a blue sky with almost no cloud. However there was a chilly breeze which continued blowing throughout. The views were pretty good today, all the main peaks with snow on them. The walking was great today. Sunny and clear, the light snowfall had transformed the landscape without putting more than a dusting underfoot in most places, and generally the track was dry and clear. 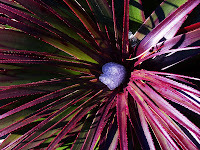 Many of the pandanni (Richea pandanifolia) had a plug of snow sitting in the crown of the leaves. Interesting sight. The leaves of these pandanni are very purple. At other times or in other places they range through various pink and red shades, in addition to the green. 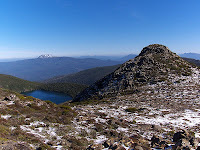 Mt Snowy makes a good alternative walk at the Hartz Mountains National Park. With this much snow around however, it would probably be a quite wet trip around the base of Hartz Peak. 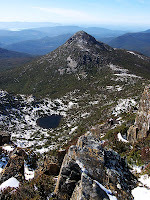 The best way to do Mt Snowy is as a circuit which includes a traverse up the long curving southern ridge of Hartz Peak. This provides good walking and extensive views. I will have to plan a Mt Snowy trip soon. Camping is quite possible at Emily Tarn. There is space for a few tents (not many), however the surrounding area does require care as it is quite fragile. Hi Kim, thanks. The pandanni are great subjects from a geometrical point of view.